It had been well over a year since our previous visit to Break Escape in the East Midlands and, in that time, they’d doubled their offering from the two we’d played last time. They’ve built up an eclectic mix of themes, with the original Egyptian and police games now joined by a Narnia-style game and this, an out-and-out scare experience. 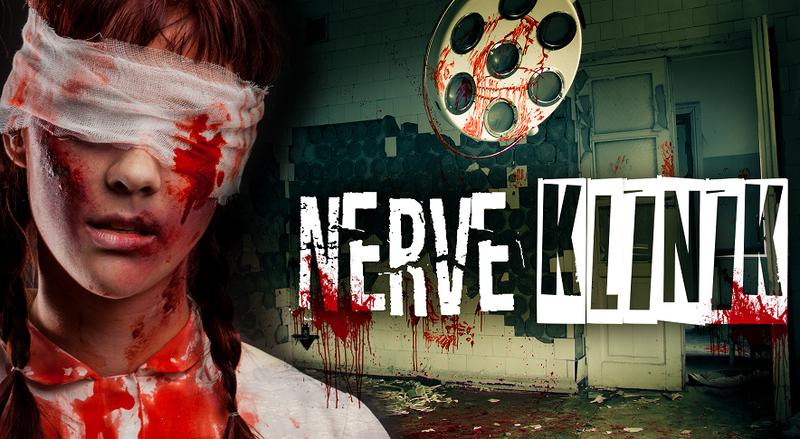 I’m not usually one for scary games, but I’d heard a rumour that there was more to Nerve Klink than you might imagine, so I wanted to give it a try, and Mrs Logic reluctantly agreed. There’s a comfy waiting area downstairs which must be cosy if you happen to have the full complement of teams waiting, but there was no one else around, and we were soon heading up to the very top of the building for our experience. There was something fun about going to the roof for this game: it feels that little bit more isolated, which is perfect for a horror experience. Your friend Sarah Jones had been looking into a way of making quick money and decided to take part in an experiment for a new drug at Dr Greuber’s clinic. Since Sarah left you haven’t heard from her so have decided to head over to the clinic to check that everything is okay. Upon entering, it’s very clear that Dr Greuber doesn’t run a normal clinic! He doesn’t appreciate unwanted visitors and is said to have laid traps around his workplace to gas potential victims if they aren’t clever and brave enough to escape within 60 minutes! I’m never quite sure how to judge a scary game’s decoration. These aren’t spaces that you’re meant to be comfortable in, and the game being reasonably dark is going to add to that feeling. Nerve Klink certainly wasn’t a welcoming environment – or one that I was keen on spending an hour inside – but that was very much the point. The initial impression is particularly stark and intimidating as you try to get your bearings, but I found that things softened a little as the game progressed, with the experience being significantly less visually intimidating by the time we reached the finale. Worry not, though: they had other ways of ramping up the fear factor during the game. Almost as soon as you’re inside the room, they start with the scares. And they’re frequent. Don’t expect to go more than five minutes without some sort of interaction. Some games go with a subtle approach, giving the players just enough input to let their imagination run wild before sitting back to watch them create their own chaos. Not here. This is far more in your face, and there were times when I instinctively backed myself into the corner of the room. If that’s at all concerning, I’ve put a spoiler section at the end of the review that will give you a little more detail about what’s involved. I don’t think there’s anything there that I wouldn’t happily tell people about a game but, since it’s not on their website, I’ll respect their decision and leave it up to you to decide. The thing about being scared, or even jumping, is that it makes solving puzzles significantly harder. If you’re not into scares, then that’s a significant downside – the game becomes more of an adventure and less of a challenge. Break Escape don’t seem to think that’s an either/or, though, and they have what I’d describe as fairly traditional puzzles to solve. Not traditional in the sense of tropes (although there are some) but traditional in the sense that, if you took all the scares out of the experience, you’d still have a fairly normal escape room to solve. With all those puzzles, I’m not entirely sure how normal teams cope with this room, because the combination of scare and challenges seemed overwhelming. Perhaps that explains why there’s not one but two clue systems in this room. One is fairly conventional, although it’s still very well themed and interspersed with humour that I found added nicely to the game. The other, which you only discover once you’re inside the game, is an enjoyable addition that manages to become part of the game world. That’s good, because it feels less like taking a clue and more like part of the story. It is also a little more cryptic which, although we by no means found it hard to work out, gave us a sense of satisfaction about decoding the clue as well as when we solved the puzzle it related to. The game makes good use of its space, sending you back and forth across the experience to complete the tasks. Combine that with some interesting transitions and use of scares, and you’re left with an experience which feels surprisingly dynamic. The finale is probably the hardest part of this room, and for me it went a little too far. You’re having to keep track of a lot of pieces of information which are easy to confuse, especially since you’re likely to be terrorised for much of your time solving it. Perhaps they ramped that up because we had a bit of time left, or maybe I felt it more because I was (at our request) bearing more of the brunt of those scares, but I far prefer an escape room to come down to puzzle-solving abilities rather than your ability to remember those solutions. That said, there was something appealing about the way we ended the game that added to the horror factor in a more subtle way than the general scares. For those of a nervous disposition, it’s worth pointing out a few things. First, there’s an actor in this room, and the way they interacted with us is probably the most intimidating experience I’ve had in an escape room. They’re not aggressive, but they are most definitely in your face. You can ask them to target that at a subset of your group, and they’ll make sure that the more timid stay out of the firing line – there are times when your team will be split, but they offer guidance about which side of the split is scarier. You’ll still get some scares during the experience, but they’ll be more traditional jump scares that apply to the whole room. We escaped with a few minutes remaining, having received around five clues. A scary game that packs in plenty of puzzles is pretty rare, but doubly so when those scares are delivered by an actor who’s quite willing to terrorise you. If you don’t like being scared, don’t go here. If your mind turns to mush when you’re scared, don’t go here. If neither of those apply, then this is a great opportunity to test your mettle both physically and mentally. We played as a pair and, as with almost any scary game, if you want the best possible (scare) experience, that’s the option I’d recommend. It’s not easy, though so, if you want to maximise your chance of escaping, I’d recommend taking along a group of four.